There’s a lot of newfangled names floating around for that thing churches usually do on Sunday mornings. We decided to round up a few of them and see just what everyone is calling their Sunday Morning [blank]. Here’s what you had to say, followed by a custom personality analysis of your church. 70% of you are holding strong to tradition and calling it a “Service.” I imagine this might be preceded by a word like “Worship,” or it might just stand alone. Either way, feel good, because you’re in the majority. You like to keep it simple and stick with what works. 6% of you refer to Sunday mornings as celebrations. Again, possibly preceded by “Community,” “Worship” or another twist on the term. What does this say about your church? You like to let people know they’re in for a good time on Sunday mornings, and they can come party with you. Another 6% of you call it a gathering. I think this one usually stands alone, but if you refer to yourself as a “gathering,” you probably tend to be a bit more free-wheeling, nomadic, and cutting edge. 3% of you go with a Sunday morning “fellowship.” I’m not sure exactly what this says about your church. To me, it says that you have donuts and coffee, but that’s not so scientific. And cheers to me for a great poll result, 0% of you call it an “environment.” Hey, I’ve heard of it before. And another 14% of you call it something else. Let’s hear it in the comments, what do you do on Sunday morning? 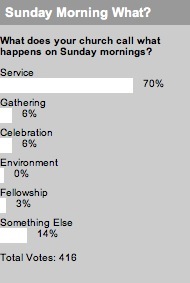 Ummm, I was one of that 6% who said we called our principal worship service on Sunday mornings a “Celebration”. As Episcopalians we “Celebrate” the Holy Eucharist, and the officiant is called the “Celebrant”. While the Resurrection is certainly a joyful event, it’s scarcely a “party”. I certainly attend the assembly as a weekly recharge of my spiritual battery. It is essential to my spiritual well-being. It brings me closer to my Christian brothers and sisters. I feel joy, closeness to God and a renewal. Because of the communion in memory of Christ’s gift with other believers, I consider it the Assembly. I’m also Episcopalian and I was thinking “Holy Eucharist” when I voted “other”. @geoffreybrown — sorry about my seeming disrespect there. I really had no idea that was why the Episcopalian church referred to it as “celebration.” It’s great to know; thanks! I was one that answered service, which probably tells you more about my non-denominational background than anything. Calling them “celebrations” for some reason has always seem contrived, as if by calling it that name we will help foster a celebratory atmosphere just by the nomenclature itself. Loved the survey. You guys keep bringing insightful stuff every week.